Our NPSL tryouts generated a tremendous amount of interest in our men's team. Skillful players from all over the Tri-Valley, the East Bay, and beyond attended. 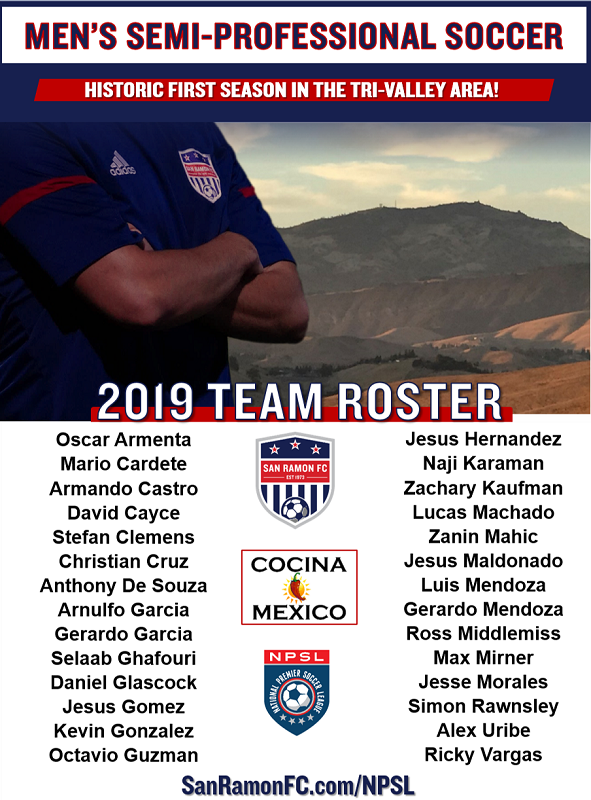 With nearly 90 players attending our open tryout and roughly half of those getting called back for a second session, our coaching staff chose a final roster for our first season. Our roster, both coaches and players, are talented and dedicated men. They will represent our team, our club, and our community with distinction. They are already hard at work training for our first ever match in the NPSL. Please mark your calendars for March 23, 2019. History will be made as our team plays its first ever NPSL game. Our team will be ready to compete in the opening match of the NPSL season vs the East Bay Stompers. Season ticket holders will also receive our FIRST EVER club scarf as a thank you for your support for local soccer in our Tri-Valley community. Email us for details on season tickets.